If you have any questions about the HALLELUJAH information page below please contact us. 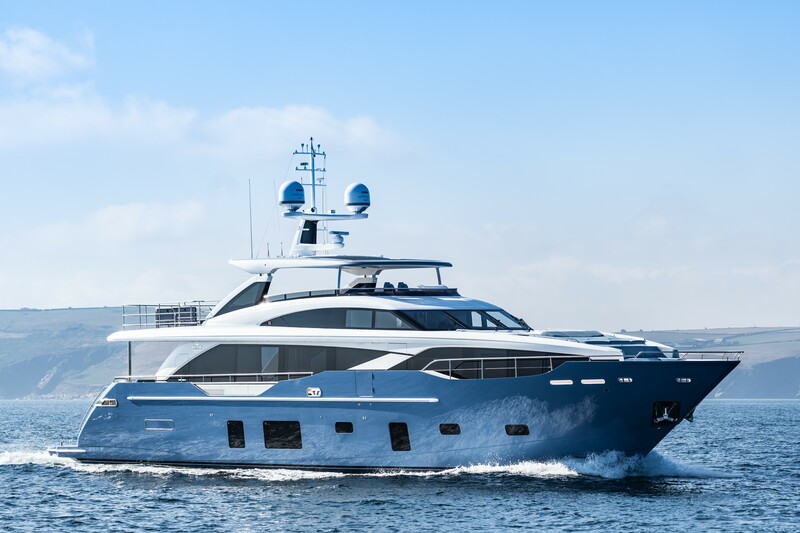 Motor yacht HALLELUJAH is a 30.45m (99' 11") luxury vessel built by Princess Yachts in 2019. 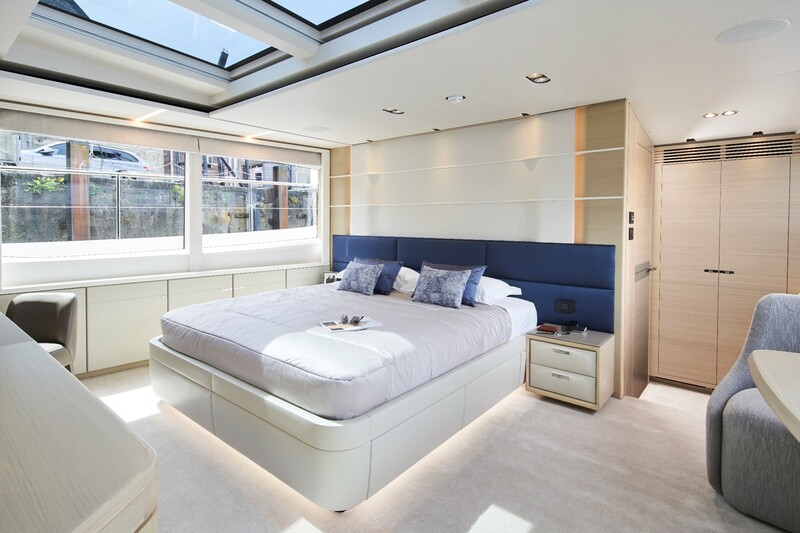 With lovely contemporary interior design and great deck areas, the yacht is able to accommodate up to ten guests in five cabins, while there is a crew of five on board. The broad swim platform is ideal for large groups disembarking from the tender, or for sunbathing close to the water. 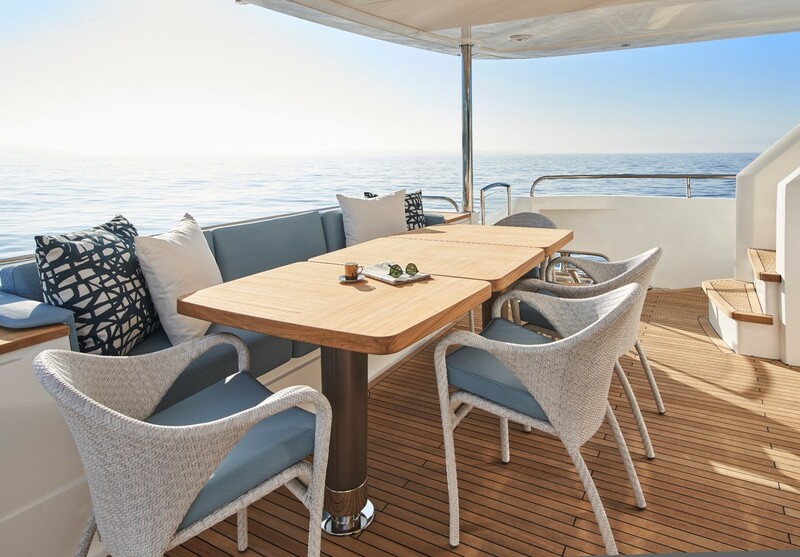 Two stairways join to the main deck aft above, where a sofa lines the stern with a raised table and free-standing seating for alfresco meals in the shade. A staircase to the flybridge is placed to port, and the wet bar beside it will provide refreshments throughout the occasion. 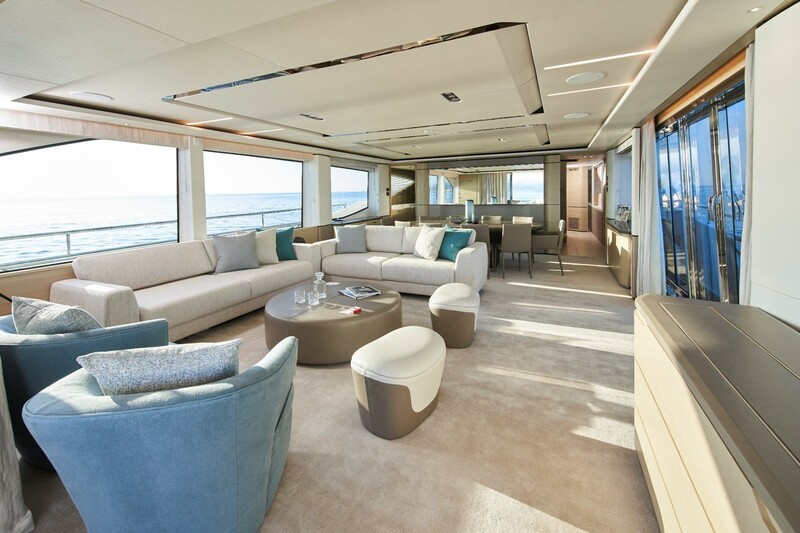 Walkways connect around to the foredeck, and to starboard beside the salon there is a fold-down terrace. 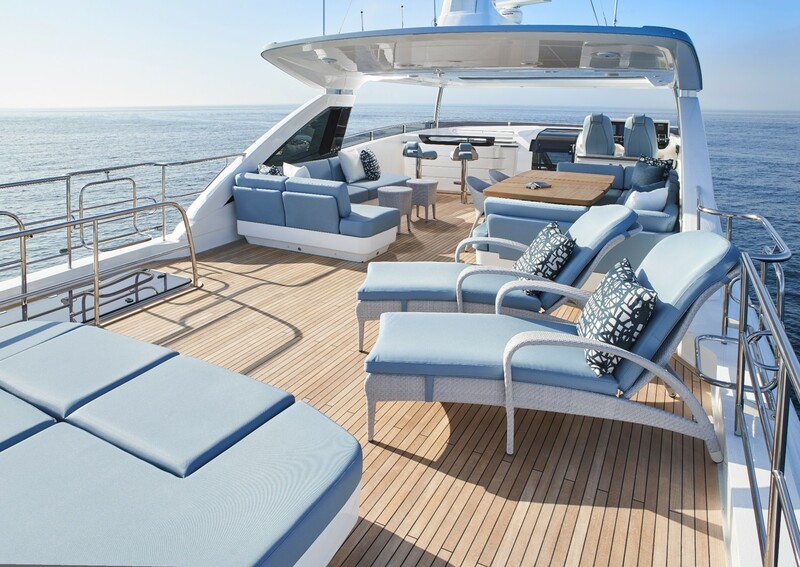 The foredeck is fitted with a wide sunbed beneath the raised pilothouse, followed by a C-shaped sofa and drinks table along the bow. 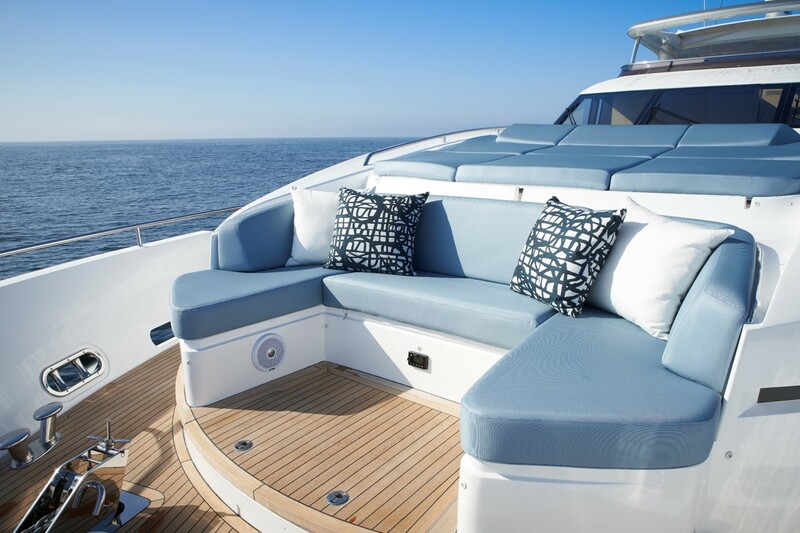 Sun loungers cover the flybridge stern and a Jacuzzi is placed in the centre of the deck behind to enjoy the views and the sunshine. 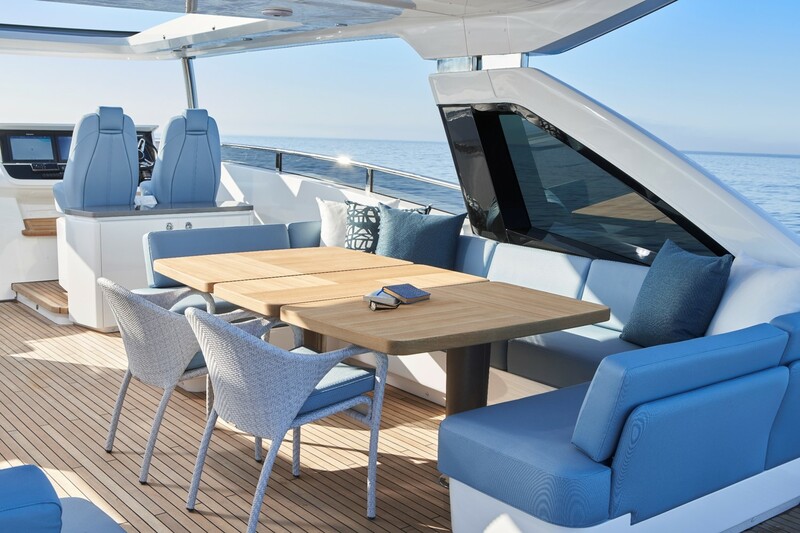 Beneath the shade of the hardtop, there is a chaise-lounger to port with two drinks tables, and to starboard, there is a C-shaped setting and raised table with two additional chairs for the whole group to dine together. The forward section of the flybridge has a port seat beside the starboard helm controls, with a staircase in the centre descending into the interior pilothouse. On the lower deck, the crew accommodation is forward with the guest accommodation amidships, behind which is the engine room followed by the tender garage. 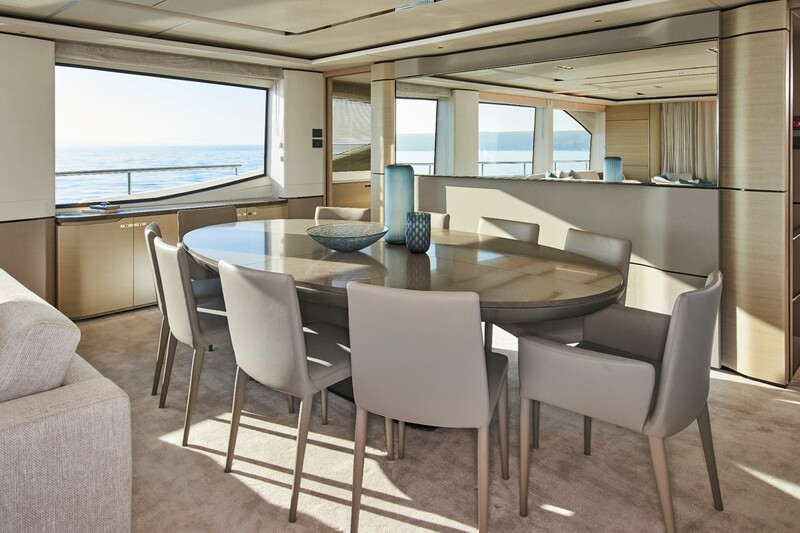 The Master suite is placed on the main deck forward followed by the galley, which has a corner sofa and table for breakfast and lunch together as a family. Behind, there is the main foyer and the open-plan formal dining area and salon, which has an elegant modern dining table to seat all guests, and the large windows to port and starboard flood the interior with light. 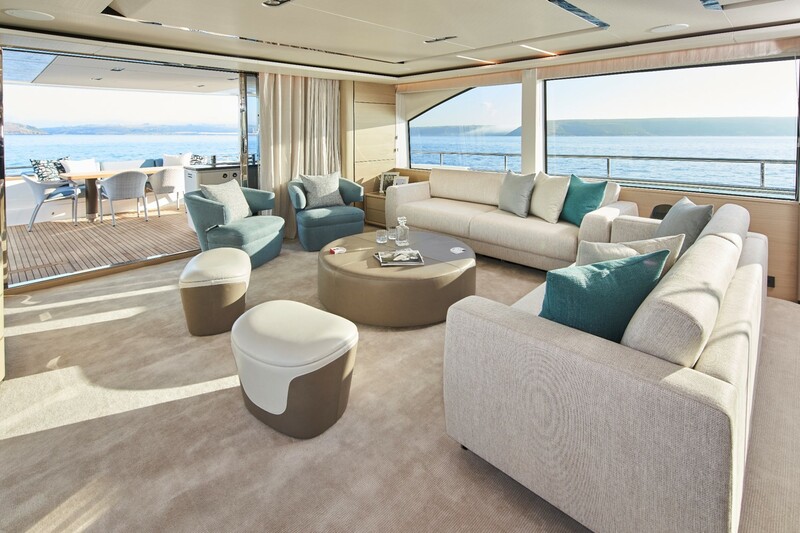 The aft salon has an aft-facing and port-side sofa as well as two armchairs and footstools around a circular coffee table. The raised pilothouse is fitted with a sofa where guests can take in the forward views from the air-conditioned interior. A stairway behind leads to the semi-covered flybridge. The engines provide a cruising speed of 17 knots. The accommodation sleeps a maximum of 10 guests over 5 en-suite cabins: 1 Master suite, 2 double cabins and 2 twin cabins, one of which is convertible to a double. ~ The Master suite is placed on the main deck forward to take advantage of the greater amount of natural light from large skylights as well as the broad windows. 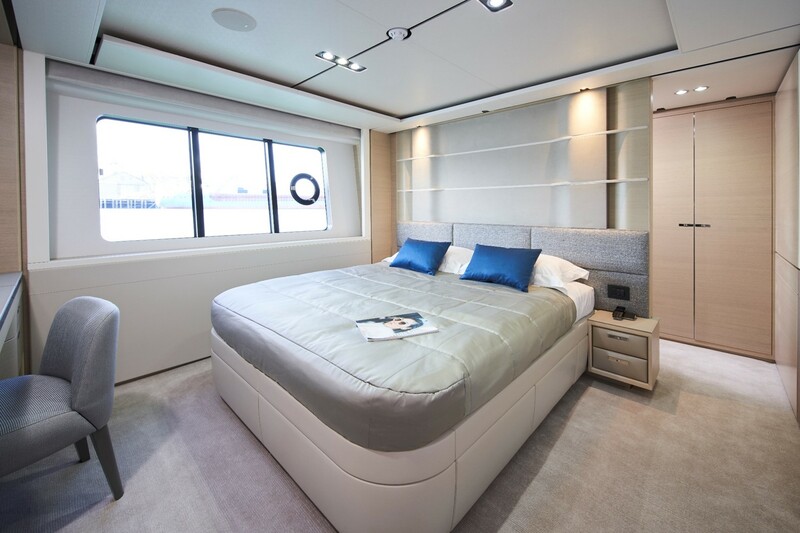 In addition to the king-sized bed, there is a widescreen TV, desk, and seating area with two armchairs and a table beside the starboard window. The en-suite bathroom has a toilet and bidet, two sinks and a shower. 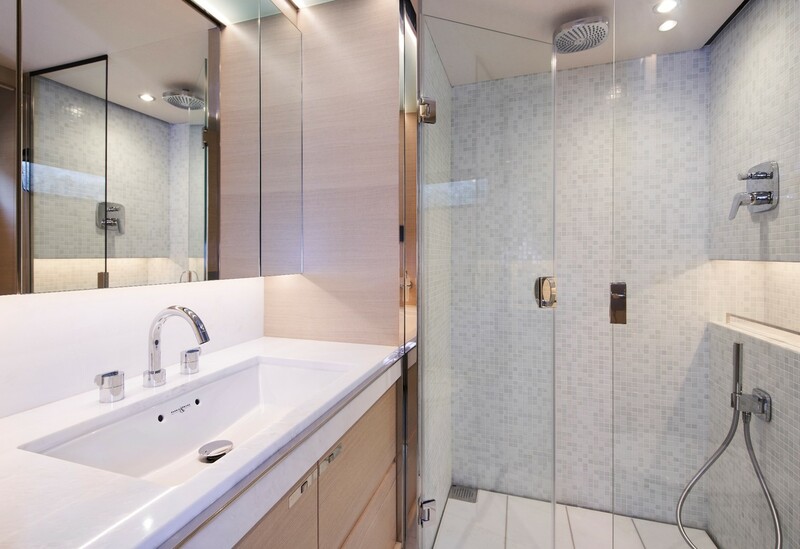 ~ The lower deck has two double cabins to port and starboard aft of the central stairway, and each cabin has a queen-sized bed, a desk, widescreen TV and an en-suite bathroom furnished with a toilet, sink and shower. 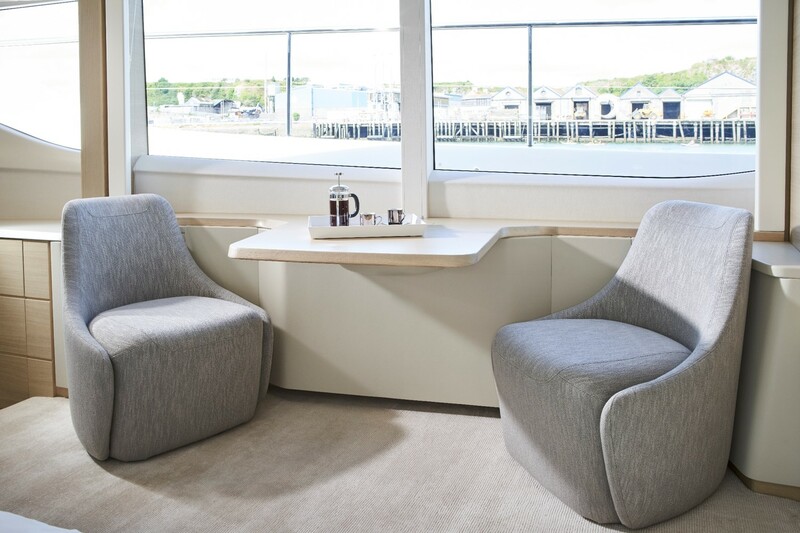 The twin cabins are located to port and starboard forward of the foyer and each has two single beds. 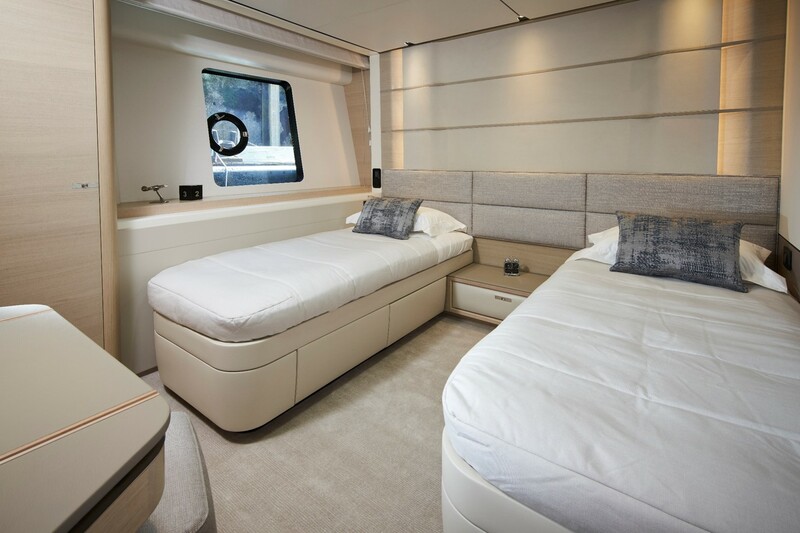 In one of the twin cabins, the beds can be placed together to create another double bedroom. There is a desk and widescreen TV in the room, and the en-suite bathroom has a toilet, sink and shower. We do have available further amenity, owner and price information for the 30.45m (99' 11") yacht HALLELUJAH, so please enquire for more information. The luxury yacht HALLELUJAH displayed on this page is merely informational and she is not necessarily available for yacht charter or for sale, nor is she represented or marketed in anyway by CharterWorld. This web page and the superyacht information contained herein is not contractual. All yacht specifications and informations are displayed in good faith but CharterWorld does not warrant or assume any legal liability or responsibility for the current accuracy, completeness, validity, or usefulness of any superyacht information and/or images displayed. All boat information is subject to change without prior notice and may not be current.